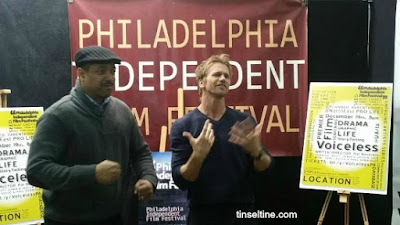 Highlighting Philly Made Film - "Voiceless"
The Philadelphia Independent Film Festival, which celebrated 8 years this past April, also presents works by Indie filmmakers periodically during the rest of the year under Emerging Cinema. Last Saturday PIFF presented the world premiere of VOICELESS a film written and directed by Pat Necerato centering around a community of faith in the Frankford area of Philadelphia and pro-life avocation. From this picture you'd think this was the cast from The Walking Dead - LOL! It's no wonder the movie took Necerato 4 years to complete, it's a wonder it came to fruition this soon. After all, most Indie films require ample time to procure funding, and often are delayed due to working around schedules dictated by budget concerns; but then you throw a hot button issue like abortion into the mix and you're really working up hill. If a movie is about a woman having to make the difficult decision of whether or not to abort her pregnancy, that doesn't really cause a stir, that's something we're all accustomed to dealing with in a story line. But Voiceless is about a male pro-life activist determined to shut down a family planning and abortion clinic. I know there are countless people in the country that support pro-life, but in Hollywood, movies normally have a more liberal viewpoint, and would focus on the woman's right to choose. Personally, I feel God doesn't need us to speak for him so vociferously on this matter. Let God be with each person individually as they make the choice and/or live with the choice. Still, I admire Necerato's determination to make Voiceless based on his own convictions and beliefs. And based on the high turn out Saturday night, it seems the film has garnered interest on both sides. T&T Quick Synopsis: Jesse (Rusty Joiner) is a recently discharged war veteran who's dealing with a pretty serious leg injury and some PTSD, which requires mandatory sessions with a psychologist, although we never see him suffer with nightmares or deep depression. He's from the Mid-West, married to a Latino woman, Julia (Jocelyn Cruz) from Philadelphia. Julia's family gets Jesse a job with her church as a Community Outreach Director. He starts out really well in the job by deciding to offer boxing lessons to kids in the neighborhood, which is a great way to channel pent up energy and anger. Only the sign across the street from the church for the Family Planning Clinic just won't let him rest. Once he notices some distraught women coming in and out of the place, it becomes his mission to discourage women from going to the clinic for abortions, and does everything in his power to try and get the clinic closed down, risking his job, his marriage and his freedom. Bottom Line: My little synopsis may seem a little heavy-handed where actually the movie is not. Despite the subject matter and the religious aspects, the film feels like a movie, it's NOT a public service announcement or propaganda film. There's a great scene where Jesse and a nurse from the clinic discuss their reasons for feeling compelled to do what they do, and it's very evenly presented. Rusty Joiner is not only hot, but adorable, so you root for him, regardless of where you stand on the issue. The coloring of the film is perfectly ghastly & gritty. In the Q&A (see audio below) Necerato talks about how long the process took to get just the right shades of yellows, grays & greens and the use of old camera lenses to bring the viewer into the troubled feeling of the film. 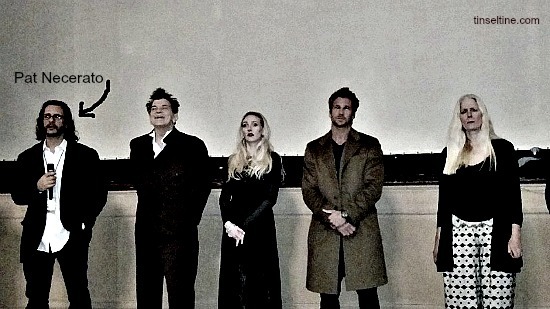 The producers, crew and local actors in the film, including Brian Anthony Wilson who plays a benefactor of the church and Christopher Mann who plays a sympathetic cop, were in attendance. The plan is for "Voiceless" to hit theaters fall of 2016. "Voiceless" post screening Q&A with Pat Necerato, moderated by Kenneth McGregor Note: audio player will not be visible to those receiving Tinsel & Tine via RSS Feed. Click HERE to listen.